How was the money spent? The Monarch High School Robotics Team, the Shazbots, worked with other school organizations, Homes of Living Hope, and the community to transform an empty shipping container into a fully functional medical and dental clinic. As the Shazbots worked on the inside of the container learning skills such as construction, residential electrical work, and installing solar panels, the Monarch High School Art Club painted a nice mountain scene on the outside to represent the State of Colorado. 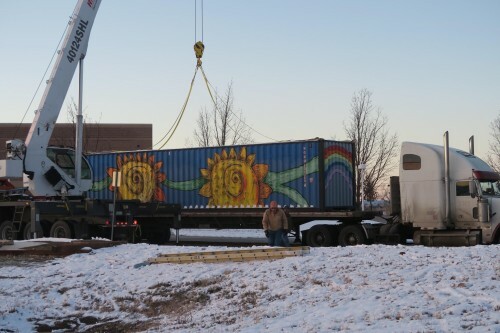 In addition to the Art Club, the plans for the container came from Monarch High School’s Architecture class, and the donations for the clinic came from various students. Outside of MHS, multiple organizations including Homes of Living Hope, Connexion Mexico, and Impact on Education contributed to building and stocking the container. Over 100 hours were spent in the spring and summer renovating the shipping container. On November 30, the container was loaded onto a semi-truck and left MHS to continue its journey to help the impoverished community of San Jose Las Palmas, Mexico. This shipping container will be used daily by hundreds of people in great need and will have a significant impact on their community.